Although we really get wet weather in winter on the Highveld a forecast of some rain prompted me to write this article. Last night when I walked my Jack Russell we had a few drops and ominous clouds, our storms can be unnerving and the slippery roads wreak havoc for motorists. Light up, headlights and taillights improve your visibility, regularly check your lights to see that they work as well as your indicators.Avoid fog lamps though as they can blind other drivers with the glare. Increase travel time,understand that your trip time may be increased by the inclement weather, don’t risk an accident by rushing to your destination on a slippery road,the bulk of the traffic will be travelling slowly so allow for that. Reduce speed, it’s simple, you should be driving at half your normal dry weather speed,don’t rush as you will increase the risk of an accident, the roads are slippery and your braking distance will increase considerably. 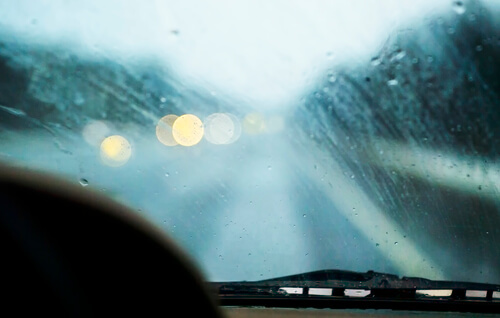 Watch and increase your following distance, your braking distance increases by almost 50% in wet weather so take this into consideration,also try and follow the vehicle in front of you as they will have dispersed water on the road giving you a slightly drier surface. Maintain contact ( and reduce speed) aquaplaning takes place when your tyres lose contact with the road surface , water occupies the space between your tyre and the road, it’s a scary feeling as for all intents and purpose you have lost control.Avoid large puddle and masses of water. If you do lose control ,reduce acceleration and gear down to regain control,be aware of your steering direction and only brake as a last resort,hard braking will cause a skid so pump the brakes lightly in a cadence fashion. Stop and pull over,if the going gets extremely rough with no visibility pull over and put your hazard lights on ,enabling other motorists to see you,alternatively if in town try get to a shopping center or service station and wait the weather out.